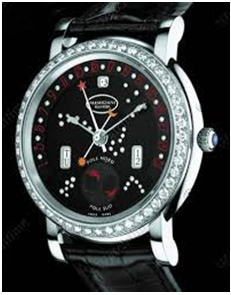 Most Complicatedly Expensive Luxury Watches For Women: Rare Beauties! The wristwatch started out as an item exclusively for women and up until World War, I was considered far too feminine for most men to wear. Wristwatches are considered as the functional pieces of fashion which are very attractive and stylish. Trends are changing yet again as women’s watches which feature technically fantastic and challenging to produce mechanical movements are becoming increasingly popular and in demand. Complicatedly expensive watches are the true symbol of luxurious life which is affordable for rich people and not for everyone. Here are some top watches made complicated enough for all collectors’ tastes and yet exclusively designed for women. With a mechanical manual winding system in it, this Patek Philippe Ladies Complication is an extremely beautiful and one of its kinds of the timepiece. The complications consist of chronograph along with hours, minutes and seconds functions. It has an alligator brand, and the whole dial is in silvery color that is painted in brown color. The complete case made up of pure 18 karats rose gold is the charm of this elegant timepiece. When it comes to complication as well as luxury and money, Parmigiani Fleurier is the watch to look out for. This Parmigiani Fleurier watch is a classic piece, whose major highlights include diamonds and the hands, which are flanked by moon and stars. Some of the major complications that it includes are automatic movement and hours, minutes and seconds functions. The precision watch features a perpetual calendar with aperture, moon phase, retrograde date, month and leap year. It is also water resistant up to a distance of 30 meters. This beauty with brains kind of rare collection is definitely a watch for a smart woman. This technical marvel is framed by an automaton in the design of a flower in bloom. 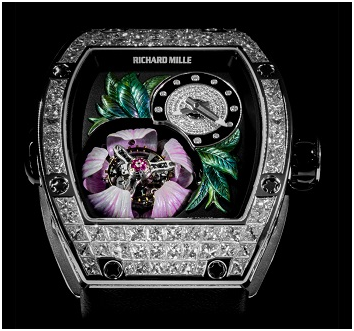 The petals of the flower, hand-painted, opens to reveal the beating heart of the watch every five minutes. The automaton is powered by a second barrel, which is wound along with the barrel that drives the mechanism, by a single crown at three o’clock. Both the pusher and the crown are clad in black onyx, which stands out in sharp contrast to the white gold case, studded with diamonds. The watch appears very feminine in design and material along with tourbillon making it one of the most complicated women watch ever. This limited edition beauty can simply not be ignored. 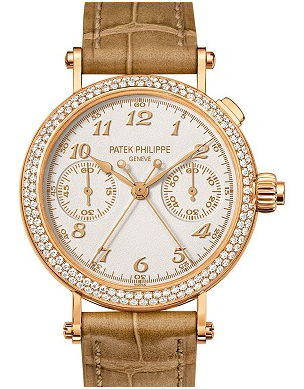 Patek Philippe has produced one of the world’s thinnest split-seconds column-wheel chronographs, in an elegant new pink gold model for women, the Ladies First Split Seconds Chronograph.On the front, the bezel is set with 153 diamonds and frames a very elegant grained opaline dial, while another 76 diamonds decorate the sapphire caseback which reveals the movement. One of the most difficult to assemble complications, a rattrapante, or split-seconds chronograph, and places it inside of a 33.2mm wide 18k rose gold watch for women with a diamond-set bezel. 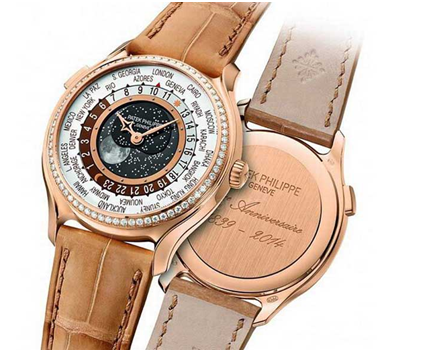 This is Patek Philippe’s most impressive welcome gesture for mechanically-inclined female buyers. 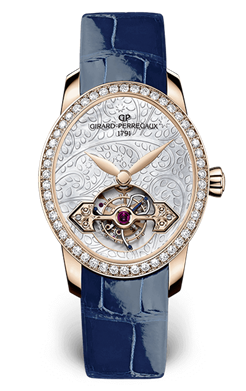 Girard-Perregaux Cat’s Eye Tourbillon is a revolution in the history of Haute Horlogerie, the first time a watch’s mechanism was imposed as an element of design in its own right, beyond its technical function. The curved lugs are designed to fit perfectly on Ladies’ wrists while the flower-shaped crown allows the watch to be wound easily. Hand-engraved mother-of-pearl, the delicate material of 0.8 mm deep is first hand-polished before being precisely carved to create a floral pattern are some of the sharpest features of this timepiece. The legendary “Tourbillon with Golden Bridge” sets the high-end horological framework and 18 karat white gold case set entirely with diamonds. 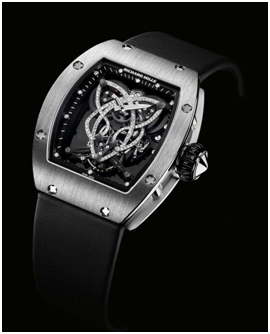 Richard Mille Caliber RM 019 Celtic Knot Tourbillon is the world’s most expensive complicated ladies watch. The complex watch comes with a case made of white gold that weighs 18 karats with a measurement of 45 millimeters by 38.2 millimeters by 12.25 millimeters.It has a unique skeleton dial and has alligator band in black color. It has manual movements and shows hours and minutes on it. The base plate of the watch is made out of black onyx. This stone is widely believed to have the power to deflect harmful energy and channel the same back to earth.